Africa’s wealth of cultural capital reflects a broader understanding that the creative industries can be a force for global economic growth. In Cape Town this week, a conference on Africa’s creative economy bangs the drum for art, culture and the creative industries. Policymakers looking for ways to nurture a more prosperous and peaceful Africa would do well to listen. A growing body of research indicates that Africa’s culture is a largely untapped resource that could give its economic development a welcome fillip. Artistic and cultural activity is also proving a driver of democratisation and can help prevent violent conflict. For too long most African leaders and foreign donors have treated art and culture as at best marginal, at worst irrelevant to core development and peacebuilding agendas. It’s time to shake off these old assumptions, understand more clearly culture’s potential and harness it to make Africa a better place to live. Economists agree the creative industries, such as film, music, TV, advertising, design, publishing, live performance and craft, together form a remarkably healthy branch of the global economy. When the crisis hit in 2008, world exports of creative goods and services continued to grow at annual rate of 14 per cent. In the UK, creative industries account for about 6 per cent of GDP. New media and communication technologies are partly to thank. They make it easier for enterprising people to create content, package it and connect to buyers – to spin imagination into profit. Africa’s slice of this creative economy pie is still very small (less than one per cent), but it has some leading lights to show the way. Nigeria’s rambunctious film industry – Nollywood – exports to the continent and beyond. Industry officials claim it’s the country’s second largest employer after agriculture. Senegalese musicians, combining traditional musical styles with modern recording, have gained a good foothold in the global market through sales and touring. Cape Town is concentrating creative, tech and business talent in one neighbourhood – The Fringe – and as next year’s World Design Capital plans to exploit the international spotlight. The creative industries are particularly interesting for Africa. They can help economies diversify and avoid an overdependence on limited natural resources. Africa’s rich artistic heritage and cultural traditions are bottomless wells of inspiration. Unemployment in crowded cities is a real problem. Creative industries can be part of the solution. They thrive on the friction of diverse people and ideas in one place and the burgeoning urban middle classes offer a ready domestic market. Creative dazzle would also help foreign investors see Africa differently – as a fertile land for good ideas, not just coffee and cocoa. A lively arts scene is the pulsing heart of an open, democratic society. It enables and encourages citizens to express their views in the public sphere, fomenting healthy debate. The arts, like the media, are also a mouthpiece with which civil society holds politicians to account. Some African governments try to deny their citizens the fundamental right of free creative expression, but many artists have shown the strength to resist state control and air alternative narratives. Hosni Mubarak, Egypt’s president until the revolution broke in 2011, recognised the power of artists and built extensive state cultural institutions to co-opt and control them. Some capitulated, others held tightly to their independence. Many writers, musicians and visual artists have been at the forefront of the revolutionary wave and continue to mobilise support for the pro-democracy movement. In Uganda, artists – singers especially – voice criticism of Yoweri Museveni’s increasingly authoritarian regime. Though the state bans songs from the radio, they still circulate on CD. This kind of politically engaged popular culture encourages citizens to play a part in shaping their country’s future. Much conflict in Africa has a cultural dimension as combatants’ motivations are often entangled with ethnicity or religion. Cultural difference is not in itself a cause of conflict, but when political actors promote their community above others they sow the seeds of an “˜us-against-them’ mentality. Once blood is spilt, cultural communities mistrust and fear one another increasing the chances of recurrent violence. Resolving conflict requires political agreements. But art can play an important part rebuilding tolerance and trust and preventing a return to arms. First, enabling all communities to express their art – that which embodies their values and way of life – in the public sphere officially recognises their value and promotes cultural pluralism. Second, when former adversaries engage together in cultural exchange and creative activities they can learn about each others’ cultures and rediscover the possibility of cooperation. Two weeks after Islamists attacked the Westgate mall in Nairobi, the killing of a Muslim cleric in Mombasa provoked riots and a church was set on fire. Relations between Christians and Muslims are under strain. To prevent further violence Kenyans need to recognise their multicultural mix and embrace cultural pluralism. Inter-faith and inter-community cultural exchange at the grass-roots, city and national levels can help them do that. Governments, industry and international experts should do more research to map and analyse Africa’s established and incipient creative industries. Using these insights, policymakers should tailor their approach to create an enabling environment for creative types. They may need to tighten up intellectual property rights regimes, invest in cultural infrastructure and work with industry on strategies to promote cultural tourism. To be effective, they’ll need to cut dead wood from cultural ministries. The state should act as an enabler, and refrain from meddling in content. Creative businesses and non-profits should lobby their governments and foreign donors with specific asks and look for operating models from elsewhere that could work for them. Arterial Network, the Africa-wide association behind the Cape Town conference, helps its members share ideas. But stronger inter-country collaboration is needed to mesh and embolden artistic communities. Donors should help professionalise creative enterprises and arts organisations, especially by boosting business skills. They should raise the profile of African creative industries and products on the international scene. Some cultural relations outfits like the British Council do this already, but donor governments should integrate support for culture and creativity into their main development and peacebuilding plans. It should not be an optional extra. A global campaign is underway to ensure the UN’s post-2015 development agenda integrates culture throughout. Africa’s policymakers and friends overseas should support it. Art and culture benefit individuals and society in many surprising ways. Creating jobs, encouraging democratic norms and healing inter-communal wounds are three, but that’s just the beginning. Ned Dalby is an independent researcher based in London. He was previously Analyst at International Crisis Group. To succeed, young people need to be inventive, resourceful and imaginative. The best way to foster that creativity is through art education (education for creativity through and with art). Yet, such education is virtually absent in East African schools. As result, creative resources of young people diminish, according to research, from 98% when a child is 5 to 2% by the age of 25, and remain under-utilised. professionals, leaders and entrepreneurs that can bring value, opportunity and change. Since 2006, MASK worked in more than 20 schools in Kenya and benefited more than 25,000 young people. 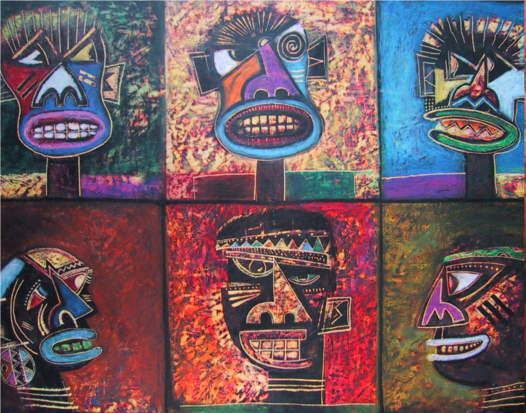 In 2013, MASK launched the MASK ART PRIZE, the national art competition for young East Africans.